Due to high demand, we have seen the need to compile a best motorized pedal exerciser review list, we have done all the hard work for you and picked out the top 3 pedal bikes on the market right now. All 3 of the motorized mini bikes in our review have been fully researched with you the user in mind, we often hear you get what you pay for, but that’s not necessarily true when it comes to mini bikes. Our top 3 exercisers are in our opinion, the best out there, and have been chosen not because they are the most expensive but because they offer the most value to the customer. You will see all three of our motorized pedal exercisers cost less than a $100 each, so should be affordable to most. Whilst we recommend it’s best to read our whole article, as we have some very useful information on what you should be looking for when buying a motorized pedal exerciser, we do know many people are in rush and don’t have time to read the full review. For those of you who do not have time to read the whole article, we have put together a comparison table so you can check out what each bike has to offer and see the price, for those who have more time, please read the full review for each bike and our handy tips. We cannot really compare a motorized pedal exerciser with other regular mini bikes on the market, the reason being is, motorized bikes are designed with one purpose in mind, to help people who can not physically pedal a regular mini exerciser. Unlike regular mini bikes, motorized bikes do not have resistance, they use adjustable speed settings. The motorized bike will let you choose whether you want to pedal fast or slow (all of the motorized bikes have variable speed settings) this allows you to choose which is best for your ability and condition. Because motorized mini bikes work without you applying any pressure to the pedal, many of you may be thinking, is this bike going to do me any good? Firstly using a motorized bike is not going to lose you many calories and it’s not going to build muscle fast, but what it will do, and what it’s designed for, is to increase blood circulation, flexibility and balance. And the great thing about mini bikes is you can achieve all of this in the comfort of your own home, from any chair, or even whilst laying down. 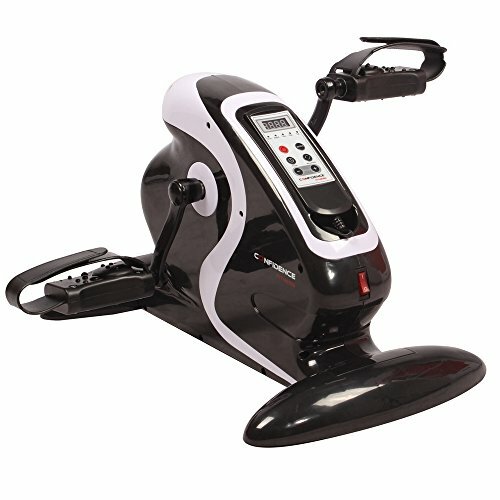 Our top pick of motorized pedal exercisers, the Confidence mini exerciser, is the most versatile of the bunch, with 12-speed settings, 6 built-in automatic programmes and the option of manual, the Confidence mini exerciser will certainly have a speed setting to suit the pace of your workout. Compare the Confidence bike to the Daiwa bike which only provides you with 4-speed settings, and priced similarly to the Confidence bike, and you start to see just how much the Confidence bike offers over some of its competitors. Not only does the Confidence exerciser provide the most speed settings it also has a whopping max RPM of 80, you may not need such a high RPM when you start using the bike, but later as you progress and set your goals higher it’s always good to have a machine that can match your goals. The Confidence mini bike has the joint highest RPM of all the mini bikes we looked at. The lightest of all the mini motorized exercisers at 10lb, but not too light to interfere with stability, the wide stabilizing feet at the front and rear of the bike accompanied by non-slip rubber and a low profile design should keep this bike from toppling when in use. The built-in computer will show you all the stats of your workout, which is easily readable form the LCD display, and what’s also nice is, you will never have to bend down to adjust the settings, this impressive pedal bike can be controlled from the cable remote control. An extremely well priced capable machine! Slightly taller in design than the Confidence pedal exerciser and designed with short width feet, the Exerpeutic exerciser will have a few stability issues, however, it is a lb or two heavier than the other two bikes in this review so the extra weight will help somewhat with stability. Not everyone will have trouble with the stability of this bike it will vary from user to user, I wouldn’t like to think it’s a deal breaker so let’s move on to the good points of the exerciser. Stability issues aside this is one of the best-motorized bikes available, and just like the Confidence bike, you have a large number of speed settings available to suit your workout needs. The Exerpeutic bike also has the LCD on the remote so you’ll have no trouble being able to read your stat workouts and change speed setting. The remote also benefits from a good length cable so you will be able to adjust without bending down to the machine. But what’s most impressive about this pedal exerciser is its max RPM, matched only by the Confidence bike at 80RPM. The Exerpeutic bike also has nice large pedals with straps, a built-in handle, great for helping you carry it from room to room and comes with an anti-slip mat for you to place the exerciser on whilst you workout. A well respected mini pedal exerciser that has been around for a few years, some may say dated in design but this bike does well at what it’s designed for and remains a popular choice for many people who need a low impact exerciser. A well designed, lightweight, low impact mini exerciser from Daiwa, great to see wide stabilizing feet in the design, this should really help this bike from toppling over when in use. The Daiwa only starts to disappoint when we see the amount of speed settings, with just 4, which makes it the least versatile of the three exercisers, if you can get past the small amount of speed settings, this mini bike is actually a well thought out piece of home exercise equipment. The bike has a built-in carrying handle, a low profile design which allows it to be used under desks and just like the two previous bikes it has a cable remote control with large LCD display. If you are looking for a stable mini exerciser than this is one of best you will find, a good tip, if you have issues with any of the bikes slipping on hard surfaces, is to buy a slip resistance mat, however if you plan on using this bike on carpeted floors then the need for a slippage mat lessens. The height of a pedal exerciser may be more important to some than it is to others. It all depends on how you plan to exercise when using the pedal exercisers. Many people who buy mini pedal bikes buy them because they simply like the idea of being able to exercise whilst sitting down, and use the bike for cardio reasons only. Buying a mini bike solely for cardio may involve taking the bike with them to work or using the bike whilst they work in the office at home, either way, both of these uses involve a desk, therefore these users will need a pedal exerciser which is low profile, the lower the better usually, as the last thing you need when using one of these things is for your knees to hit the desk whilst pedaling. 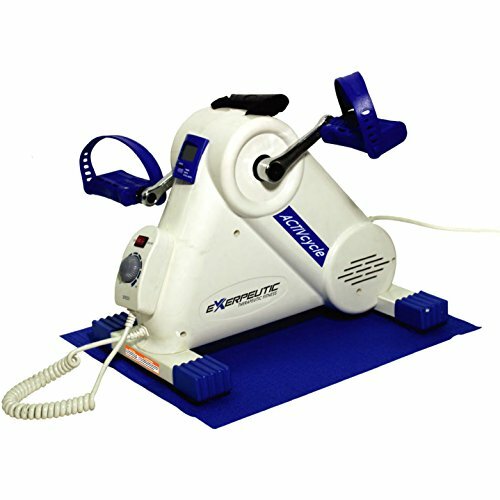 Most people who buy a motorized pedal exerciser are either recovering from an injury/operation or are disabled in some way, so not many of you will be taking the exerciser to work, which means most will want one either for use lying down or sitting in the comfort of your armchair watching tv or reading. This will certainly mean the height is less important to you, but for people recovering from an injury you will slowly start to feel better and you may want to carry on using this bike when you’re fully recovered (when used in manual mode they do have excellent cardio benefits), all the motorized bikes come with a manual setting for a greater resistance. It’s always better to think ahead and get the most from your money, so if you plan on using the mini exerciser after recovery, choose one that is better suited (low profile) for a desk. What’s great about mini pedal exercisers is they weigh a fraction of the weight of an upright stationary exercise bike, a pedal exerciser generally weighs around 5lb-15lb, a normal exercise bike anywhere from 30-150lb, as you can see the mini bike is going to be so much easier to carry from room to room and store, they also come with built-in handles to make the job that much simpler. But being light does have its disadvantages, a light bike will provide less stability, and it’s one of the main problems with mini pedal bikes, especially if you have difficulties bending to do up the foot straps, many of the bikes will topple, this is why sometimes if you are heavily disabled, help with the foot straps may be needed. We recommend a weight of anywhere between 8-15 lb for a motorized mini exerciser, any lighter and the bike will have stability issues. You want a bike that’s light enough to carry and store with ease, but heavy enough to aid stability. Not essential but can come in very handy, a handheld speed controller will let you change the speed setting without having to bend to change them on the machines, great for speedy adjustment times. All 3 of our pedal exercisers come with a built-in speed controller. Probably the most important feature of any motorized pedal exerciser is that the exerciser includes a useful amount of speed settings. The larger the number of speed settings the better when it comes to motorized bikes, the greater the choice, the more goals you can set. Also just about anyone starting out with a bike will be able to find a pace that suits them best. Every motorized pedal exerciser in our review has a built-in mini computer that can either be used attached to the equipment or taken out and used as a handheld remote for the bike. What do the mini computers do? You can check how many calories you’re burning, you can set the speed at which you wish to exercise, choose the duration of exercises and distance traveled. You can also set the mini bike to manual from the remote if you wish to use the bike without the motorized option. Something else to look out for: has the pedal exerciser been designed well to exercise both the upper and lower body? You will be happy to hear all three of our bikes in this review are excellent for both upper and lower low impact workouts. Each bike has both pedals and handles making it a breeze to use with either your legs or arms, they are also light enough to be easily picked up from the floor and placed on the table for your upper body workout. Whilst there are many excellent motorized pedal exercisers on the market there are two that stand out from the rest, the first being the Confidence mini exerciser and the second the Exerpeuter mini exerciser, both of these bikes offer a safe, versatile workout for their users. Both bikes have a useful amount of speed settings and both have proven to be durable. Let’s not forget they also offer the max 80RPM. The third offering, the Diawa bike is brilliant in design, but it lacks versatility with just 4-speed settings and only a max of 60RPM, which is disappointing at this price. 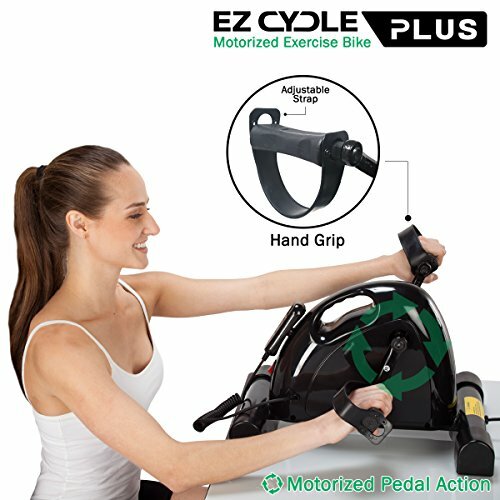 If you have been looking for a lightweight motorized bike that doesn’t compromise on stability and offers you all the versatility to achieve your workout goals then the Confidence Fitness Motorized Pedal Exerciser would have to be our recommended choice, this excellent mini exerciser offers you a whole lot at a very affordable price.